When selecting crafts to offer your children, choose ones that will naturally become part of your children’s play, rather than just doing craft for craft’s sake. 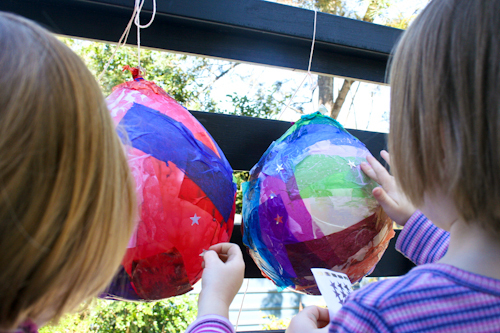 Aisha chose today’s craft — hot-air balloons — perfect for taking the girls’ little people for a high ride! 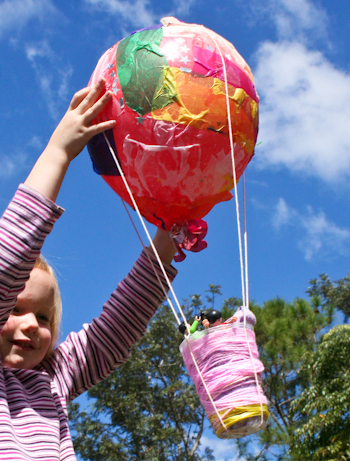 Once the hot-air balloon is assembled, it's great for taking toys for a ride! This craft is not much more than an excuse to paint huge amounts of glue. But paintbrushes are a favourite tool of pre-schoolers. And it’s very satisfying for the children to see the colours covering the balloon. 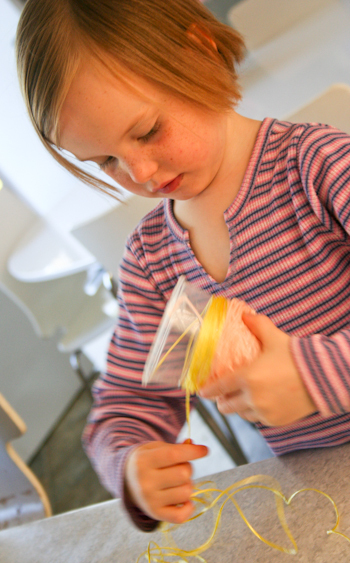 The last steps are to wind wool around the plastic cup to make a basket and tie it all together. Choose your spot. You need to be able to suspend the balloons above your children so they can paint all over them. 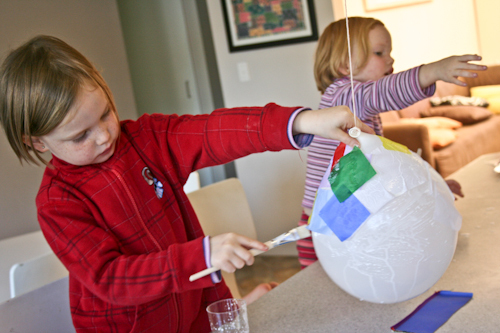 This is a messy craft, and you also need to be able to lay down newspaper where ever there may possibly be glue drips. Do you have an outside clothesline you can work under? We chose to do ours at the kitchen counter, and I hung the balloons from a wooden beam that runs directly overhead. Cut tissue paper into pieces. I started with cutting about 20cm off a 20-sheet multi-coloured pack and then cut that into strips and then pieces (while they were still in their layers — who wants to cut individual sheets up?) That amount seemed about right for covering three balloons. Water down the glue. I squirted glue into plastic cups and mixed some water with it. Initially I thought I had watered it down too much, but it still worked well. I also discovered that the brushes were too heavy to sit properly in the cups, and so after Brioni knocked her glue-cup over, I gave her a heavier tea-cup of glue, and that was more stable. Assemble your materials and tools. 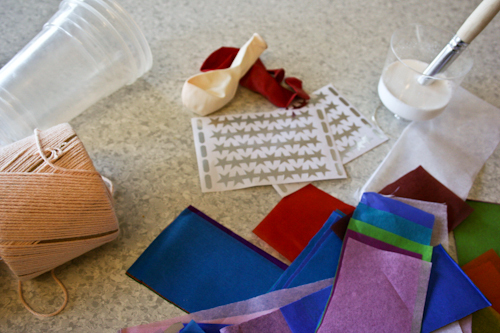 You'll need tissue paper (crepe paper), wool/string, balloons, plastic cups, glue and stickers for added decoration. You'll also need to use paintbrushes, scissors and sticky tape. Blow up your balloons. Tie them up so you can paint all around them. Provide glue and the tissue paper, and start painting. This is lots of fun and kept my 5yo and 4yo busy for about an hour. Let the wet balloons dry. I moved ours outside to dry in the sun and then put them up _very_ high because the girls tended to try to jump up and swat at them. 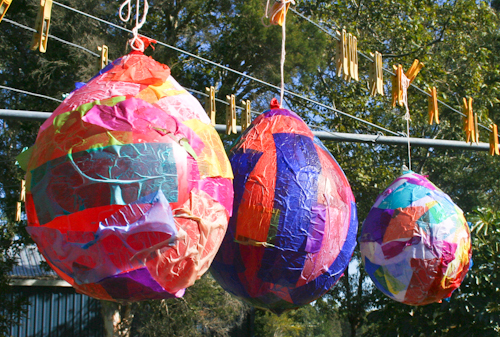 The balloons still dripped glue, so lay newspaper under your drying spot for easy clean-up. It was at this point that my balloon (centre — isn’t it beautiful?) popped — possibly because I blew it up too much so the air couldn’t expand as it heated up. Wind wool or string around the plastic cups to make your baskets. When they're dry, you can decorate your balloons with stickers. 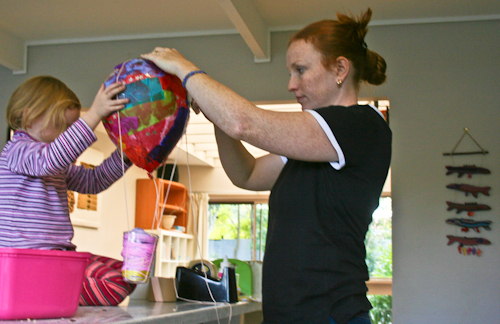 Hang the basket underneath the balloon with lines of string and lots of sticky-tape to hold it all in place. This is the most Mummy-intensive part of the craft. Basically I did all the stringing and taping, and the girls just held their balloon in place. Find some toys to take for a ride. That looks like so much fun! I need to book mark this. This looks like something my girls would enjoy and play with day after day. Hmmmmmm….this may be something to consider. I’m trying to get over my fear of crafts. Now, Erin, that’s my style too! I will definitely have to remember this craft. Thanks for sharing. Not sure how I found your blog, but I will be following. They turned out great and will be so much fun for imaginative play. Haha Erin J, love it! I loved the idea!!! It’s simple yet fun and cool. I’m just wondering how long did the balloons take to dry… Was it more than 2 hours?